Susan wanted to make a birthday card for her best friend but needed some art supplies. 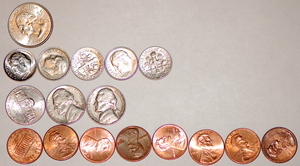 She emptied her piggy bank and found 1 quarter, 5 dimes, 3 nickels, and 8 pennies. How much money did Susan find in her piggy bank? Show or explain how you know. Susan went to the store with her mother and saw a pack of stickers for 35¢ and a glitter pen for 60¢. Does Susan have enough money to buy both items to make her birthday card? Show or explain how you know. While Susan was at the store, she saw a ring that she would like to have herself. The ring costs 45¢. Can she still buy one or both of the other items? The purpose of this task is to address the concept of opportunity cost through a real-world context involving money. In economics, resources are limited, but our wants are unlimited. Therefore, choices must be made. Every choice involves a cost. Your opportunity cost is the value of the next best alternative you gave up, or did not choose, when making a decision. To learn more about opportunity cost, visit econedLink.org. Prior to this task, it would be helpful for students to have a basic understanding of decision making. The teacher can hold a discussion with students regarding opportunity cost by asking them what Susan is giving up if she buys the ring. Responses might include 45¢, the glitter pen, the stickers, or even the ability to make the card the way she wanted to. At this point, a grade-appropriate definition/explanation of opportunity cost could be discussed. Second graders are ready to think about the ideas presented by the task, but depending on their reading level, the questions might be best presented verbally by the teacher before students are asked to work independently or in groups. Note that the numbers were carefully chosen so that the addition and subtraction they do is within 100 (2.OA.1) and the steps shown in finding these sums and differences reflect strategies based on place value and properties of operations (2.NBT.5). Also, students in second grade are asked to skip-count by 5′s, 10′s, and 100′s (see 2.NBT.2) but have not yet formalized these ideas in terms of the concept of multiplication. As a result, the solution given shows a skip-counting approach; if this task were given to third graders, they would be more likely to naturally formulate the solution in terms of multiplication. So the dimes are worth 50¢. So the nickels are worth 15¢. Since she has 98¢, she has enough money to buy both the the pack of stickers and the glitter pen. That is more than enough to buy the stickers, but not enough to buy the glitter pen.